A Barclays' survey of over 2,000 individuals with a net worth over $1.5 billion contains some pretty interesting results. Those in China and Singapore are most likely to leave their country, while those in the US and India were most likely to stay. 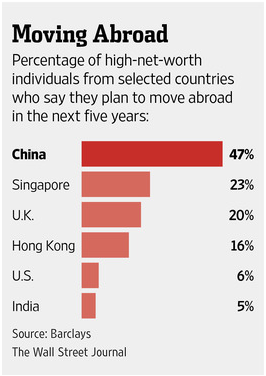 Please consider Almost Half of Wealthy Chinese Want to Leave. Nearly half of wealthy Chinese are planning to move to another country within the next five years, according to a new Barclays survey. Singaporeans were the second-most eager to flee home, with 23% planning to relocate in five years, followed by 20% for the U.K. and 16% for Hong Kong. Indian and American rich are the least likely to move, with only 5% and 6% of respondents saying they would relocate. The top reasons Chinese cite for moving abroad are better educational and employment opportunities for children (78%), economic security and desirable climate (73%), and better health care and social services (18%). Hong Kong is their top destination (30%), followed by Canada (23%). I am not surprised that a large percentage of extremely wealthy Chinese hope to relocate to another country within 5 years. However, I am surprised by the reasons given. I would have expected air and water pollution to be one of the top reasons. Instead, education, employment opportunities, and economic security headed up the list. For health reasons alone (air and water pollution), I could never live in China. Politics, freedom of expression, food, and the sheer number of people living in the country add to my list of reasons. Curiously, China was the top choice of 30% of those who would leave Singapore.